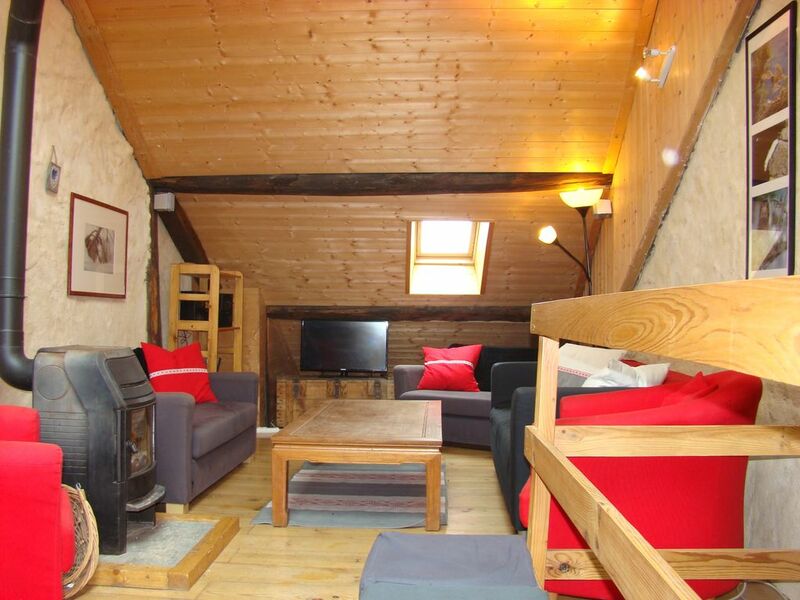 Situated on the ramparts of the Vauban city of Briançon, this renovated 18th century is excellent for groups. The view from the house is the ski resort of Serre Chevalier and the cable car (10minutes walk) and the guisane Valley to the Lautaret Pass and the Galibier. The house is on the ramparts and the 18th century, it was renovated to 7 bedrooms, 6 showers, 5 toilets, a family kitchen, a dining area and a living room on two levels in the barn with stove wood. The house is in the Vauban city with all its bars, cafes, restaurants and convenience stores. You can then go out at night without taking the car. There are seven bedrooms (most of have a double and a single), two of them have their own shower. There are three bathrooms and a separate toilet. The kitchen is well equipped for large groups with a large gas stove. There is also a fridge freezer, microwave and dishwasher. The top of the house is a large open living space on two levels, with a wood burning stove, TV and DVD player. Below the house there is a second entrance with a large space for storing and drying can be business or store bicycles and boats. There is also a utility room with dishwasher and dryer. In Briançon you can practice numerous activities in summer and winter. In winter you are in the ski area of ​​Serre Chevalier and 15 minutes of Montgenèvre. There are also beautiful outdoor place for cross country skiing and snowshoeing. You can rent sheets and benefit from a cleaning service at the end of your stay We can put you in contact for the rental of kayak and rafting as well as qualified instructors. We can also put you in contact with ski and snowboard schools and equipment rental shops. Baby equipment can be loaned. The house dates from the 18th century is on the ramparts of the city Vauban de Briancon, site classified UNESCO heritage. You can explore the streets and alley of the city Vauban and its fortifications and stop in one of the many cafes and bars or eat in one of the restaurants without taking the car .. It is 1.2km from the Prorel gondola that took you directly to the top of the station of Serre Chevalier the Montgenevre stations and the Olympic field of La Via Latte is 15 minutes. Winter There are also beautiful Nordic ski slopes in the Clarée Valley at 5 minutes and snowshoeing. In summer the region is also known for the mythical passes of the Tour de France such as Izoard, Lauteret and Galibier which are possible by bike from the house. The lifts of Serre Chevalier are open in the summer for mountain biking or hiking at altitude. There are also rivers for whitewater sports as well as numerous beautiful hiking trails. Vous pouvez demander un service ménage après votre séjour , il est de 150 euros. Si non la maison doit être laisser propre. Vous pouvez louer le linge de lit pour votre séjour, le tarif est 15 euros par personne, ainsi vos lits seront prêt a votre arriver. Nos clients sont priées d'emmener leurs propres serviettes.